With a Kick: A new and enticing ice cream franchise, with a unique blend of full flavor, mischief, and romance. Patrick and Lee are struggling to make a success of their alcoholic ice cream shop in the center of tourist London. At the same time, their business partnership may take a turn toward the personal - if either of them can find the time and nerve to go for it! Meanwhile, they cater to the wild and wonderful range of customers in the area, many of whom have their own romantic agenda. Will ice cream be the final ingredient they’re all looking for? Pluck and Play: Curtis is a cheery young entrepreneur secretly licking his wounds after being beaten up by his ex-lover. Handsome cowboy Riley is stranded in London without money. His consolation is his music, and his fascination is Curtis. Their music brings them together, Riley’s guitar and Curtis’ poetry. But when Curtis is threatened by his ex-lover, Riley intends to be the man to help. Double Scoop: A sudden disaster strikes the novelty ice cream shop With a Kick, threatening the livelihood of its owner, Patrick, and also his assistant Lee. The last thing in the world Patrick wants is to hurt Lee, but deeply held insecurities prevent him from confessing his love. And how long will Lee wait to make his own move? Hopefully, the disaster brings a new opportunity for them to make a go of things. Collection No. 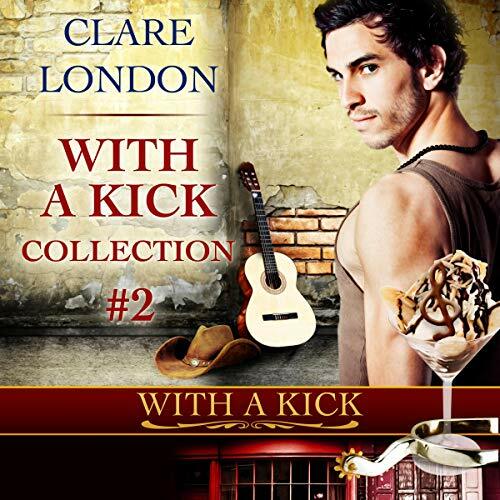 1 has also been released, featuring Clare London’s first two novellas, A Twist and Two Balls and Slap and Tickle, and also the two bonus short stories "Nice and Snow" and "Smack Happy".